Few people realise there is a hidden world in the heart of the Hauraki plains -much loved by both hunters and ecologists alike ­- the Kopuatai Peat Dome covering nearly ten thousand hectares. Walking in the Kopuatai peatlands is like walking on the crust of a pudding, bouncing along and every now and then breaking through and sinking up to your thighs. In places, rushes breaking down underfoot provide a bouncy surface to walk on, elsewhere sphagnum moss forms a spongy carpet. Waikato wetland expert Bev Clarkson says it’s easy to tell the difference between a swamp and a bog. “If your gumboots fill up with water all the time, you are in a swamp. If your feet stay dry most of the time and the vegetation supports your weight, you are in a bog.” It is an important distinction as the vegetation of the bog tends to be more fragile, and walking on them has a huge and lasting impact. Wetlands develop from swamps to bogs over thousands of years. First, high nutrient species such as raupo, harakeke (flax) and sedges colonise poorly drained depressions in river terraces or basins. Those that need fewer nutrients such as manuka and tangle fern then replace these plants. Over time wire rush (Empodisma robustum) takes over and starts to vigorously form peat as the conditions become more and more acidic, and too low in nutrients and oxygen for bacteria to break the plant material down. Over thousands of years a gentle dome is formed, rising above the influence of ground water. This is what defines a bog – an area fed only by rainwater. The last plant to arrive is the 2.4 m tall giant cane rush (Sporadanthus ferrugineus). 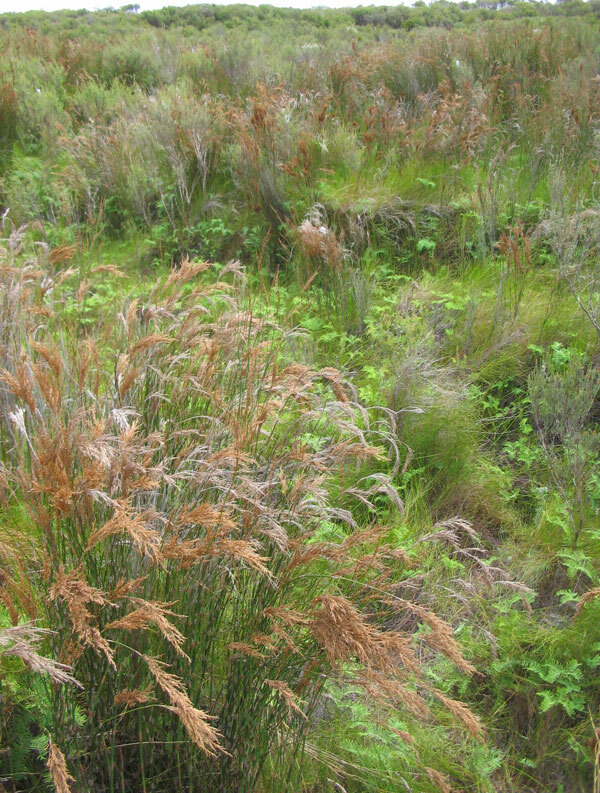 It grows in only three places in the world, all in the Waikato peat bogs, and is most abundant in Kopuatai. A mysterious caterpillar nicknamed “Fred the Thread” has recently been discovered living in Sporadanthus. 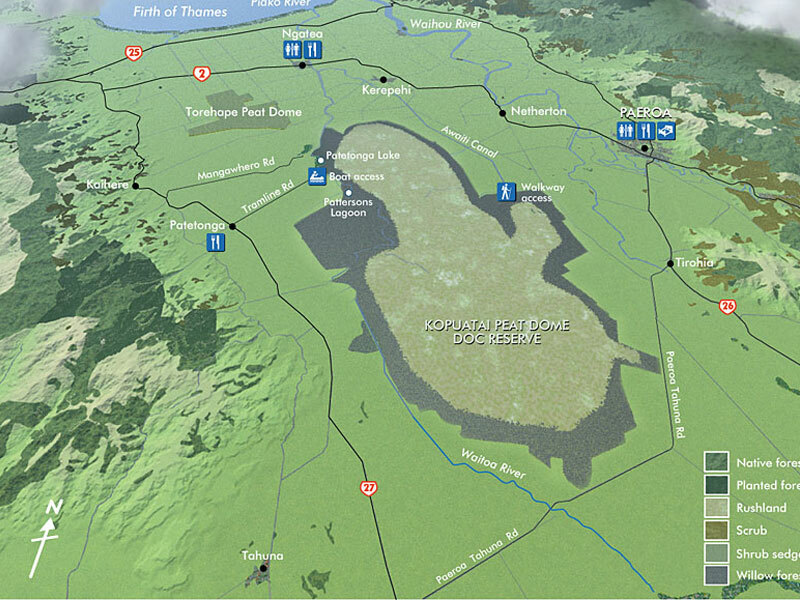 This is the largest (10,201 ha) unaltered raised bog in New Zealand, surrounded by swampland and associated lagoons. Established as a Ramsar Site on 04/12/89. There is boat access to the western mineralised areas and the Waitoa River for duck hunting. Some of the original kahikatea forest can be seen along the eastern end of the peat dome. Boat access is from the end of Tramline Road or Maukoro Landing Road off SH27 near Patetonga. 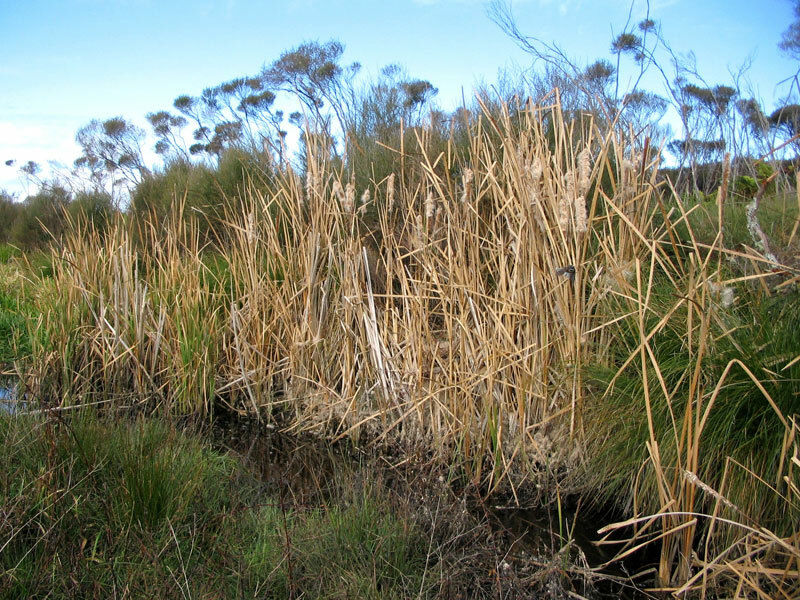 Read more about Kopuatai Peat Dome in the Directory of Wetlands in New Zealand (see Chapter 14).